Dr. S.J. 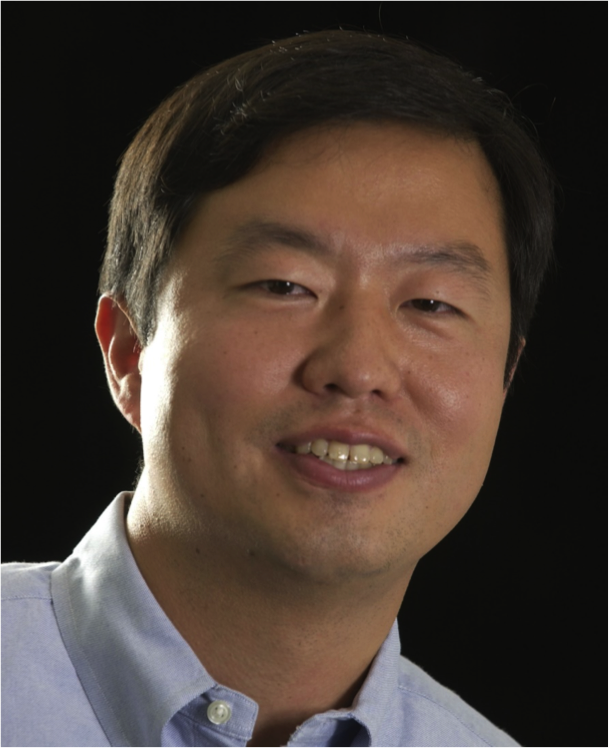 Ben Yoo is a professor at U.C. Davis working on SPIDER technology in collaboration with Lockheed Martin. SPIDER on a lab workbench. 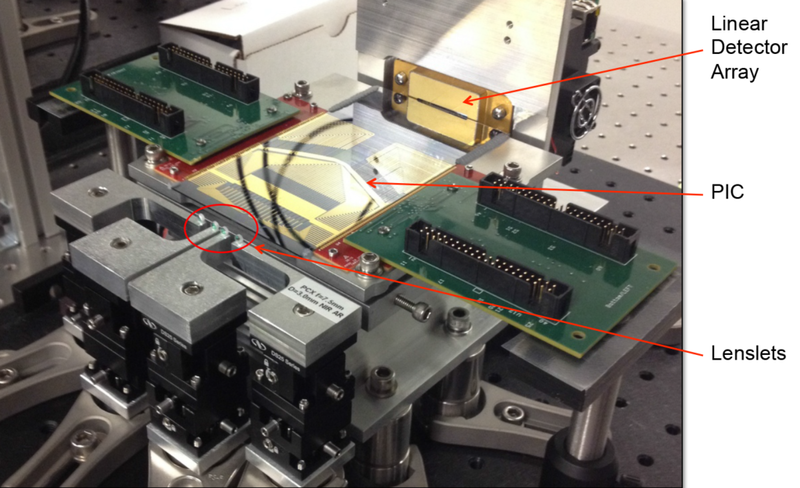 The key components are labeled here: the lenslets, PIC, and linear detector array. Image credit: Tiehui Su et al. Within SPIDER, linear arrays of lenslets are arranged in a spoke-like pattern around an inner alignment cylinder. Image credit: Lockheed Martin Corp. The multi-layered PIC card consists of many pairs of waveguides, each leading to an on-chip spectrometer. This diagram shows the PIC circuitry. Graphic credit: Tiehui Su et al. May 22, 2017 • In space, smaller means cheaper. Getting something off of the ground and into orbit is an expensive endeavor. A great strength of the Landsat series of satellites is its consistency, because of this consistency scientists can monitor long-term trends on Earth’s land surface over decades. Instrument consistency makes Landsat what we like to call a “science-grade” satellite. But consistency comes with its own price: satellites must be built with internal calibration mechanisms, and exacting specifications on sensor performance means extreme instrument vetting is needed. Satellite size has historically been a trade-off for scientific accuracy of sensors, but research supported by NASA’s Earth Science Technology Office (ESTO) aims to change that. ESTO has been funding cutting-edge research into next generation Earth observing technology—technology that can deliver science-grade data with compact instrumentation, and often enhanced spectral or spatial characteristics. To learn more about how these ESTO investments could impact the future of Landsat we are conducting a series of interviews with ESTO-funded researchers working on technology for the Landsat 10 era and beyond. You aim to replace traditional large telescopes with the SPIDER instrument. What does the acronym SPIDER stand for? In broad strokes, how does SPIDER work for land imaging? Originally, named by Lockheed Martin scientists, SPIDER stands for Segmented Planar Imaging Detector for Electrooptical Reconnaissance. Light from a land scene is coupled through multiple pairs of separated lenslets into waveguides on a photonic integrated circuit (PIC) chip and combined to form the interference pattern. By measuring the interference pattern from these baselines on each of many PICs, the SPIDER can reconstruct the intensity distribution of the scene can be reconstructed using Fourier transformations and other signal processing methods. What makes it possible for SPIDER to not need the traditional focal length of today’s telescopes? 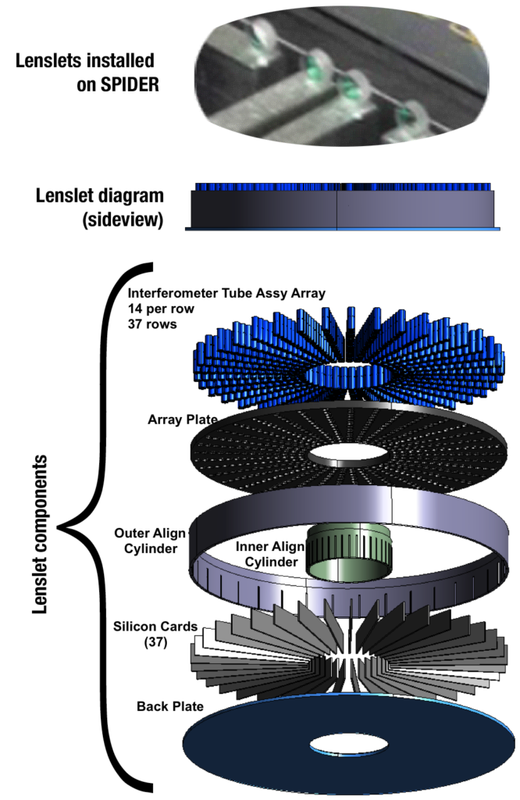 The SPIDER imager replaces the traditional optical telescope and digital focal plane detector array with a densely packed interferometer array based on high-precision photonic integrated circuit (PIC) technologies that samples the object being imaged in the Fourier domain (i.e., spatial frequency domain), and then reconstructs an image. Our approach replaces the large optics and structures required by a conventional telescope with PICs that are constructed by standard computer chip fabrication techniques (e.g., complementary metal oxide semiconductor, or CMOS, fabrication). Since multiple PICs can be placed as ‘PIC cards’ on a platform, the SPIDER imager can be much smaller and lighter than the traditional imager—by nearly 100x. In addition, it does not require constant heating to keep the traditional telescope tube in shape. How is SPIDER’s lenslet array different from traditional telescope lenses? Each lens of the SPIDER lenslet array stands in front of the waveguide facet of the PIC to sample the object being imaged onto each detector that will record interference patterns. This is different from the large lens or the large reflector in a traditional imager that collects light and projects the image onto a detector array. What does the photonic integrated circuit (PIC) array card do? 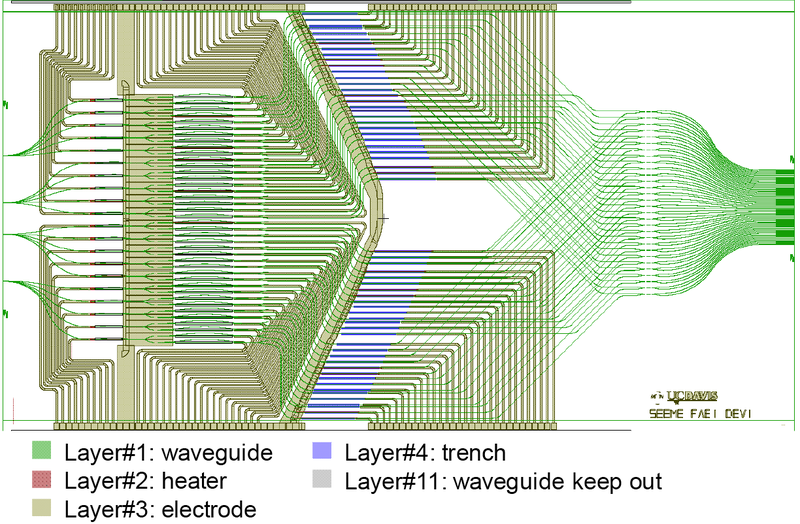 Each PIC card consists of many pairs of waveguides, each leading to an on-chip spectrometer (total of eighty waveguides), after reaching the on-chip spectrometer a tunable Mach-Zehnder interferometer constructs interferograms from each pair of the waveguides. At the output of the Mach-Zehnder interferometer is a detector array to collect the interferograms. The optical path difference of each interferometer baseline is kept to within 1 μm to maximize the visibility of the interference measurement. The SPIDER imager contains 37 or more of such PIC cards to construct interferometric images in the entire 2D Fourier domain so that 2D images can be reconstructed. How long has SPIDER been in development? What are some of the other advantages of a SPIDER-like instrument compared to today’s Landsat instruments? The standard EO payload integration and testing process involves precision alignment and testing of an instruments optical components to form a diffraction limited telescope. With SPIDER, this process is replaced by in-process integration and testing as part of the PIC fabrication and that substantially reduces associated schedule and cost. When do estimate that SPIDER technology could be flight-ready for a Landsat-type satellite? In ~ 7 years perhaps? How was the concept for the SPIDER instrument born? SPIDER was invented by Drs. Alan Duncan and Rick Kendrick of Lockheed Martin Corp. in 2011. There was always a desire to achieve high-resolution imaging with inexpensive, compact, and lightweight telescopes that did not require constant heating or cooling to maintain shape. Around that time, Duncan and Kendrick visited UC Davis looking for collaborations, and my group started developing the PICs for SPIDER. Can you tell us a bit about you… what is your background? How did you first become interested in optical design? Interestingly enough, my father believed that ‘the space age’ was coming immediately after the first satellite launch—Sputnik 1—in October 1957. So he decided to have two kids named ‘uni-‘ and ‘-verse’ in Korean, so that the two kids together stood for ‘universe’. (I am the second son, ‘-verse’). Funny, but it is true. I was always fascinated by the space missions, I built plastic models of the Apollo rockets, and followed the Space Shuttle mission stories. As an undergrad and grad student at Stanford, I studied optics and photonic technologies thinking that we needed optical computing, signal processing, imaging, and communication tools for space missions. The NASA Innovative Advanced Concepts (NIAC) program brought me and my SPIDER work into collaboration with NASA. And for fun… When you are not in the lab, what are some of your preferred pastimes? Climbing mountains, star gazing, building plastic models, soccer, swimming, etc, are my favorite activities that I don’t get to do as much as I want to because I also very much like spending time in the lab! This entry is filed under News, People of Landsat, Q&A, Technical News.